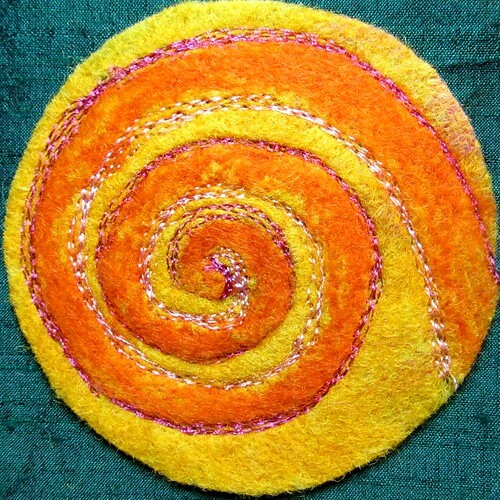 Spiraling to find a center? When I ride, the horse and I will spiral from a large circle into a smaller circle, and then leg yield out again. This helps the horse place her hind legs more under her, and carry herself better. To me though, this piece feels more like spiraling towards the center, the point of balance. It is a kind of seeking thing, the precise reverse of what a scenting hound does; spiraling out from the last known location of the target, and seeking a scent. lee, i had forgotten about the spirals… i love how you relate riding to fiber.